This is James Parker reporting. Yosemite is amazing! The rock walls here are thousands of feet high. The Parkers hit the trail once again, this time in Yosemite, one of the country's most popular parks. Ten-year-old twins James and Morgan take in the beauty of the sequoia trees and attempt an ascent of the cables. 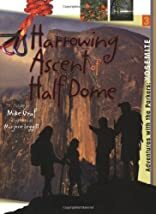 Will they make it to the top of the infamous Half Dome? Harrowing Ascent of Half Dome is the third book in the Adventures with the Parkers series for kids. Each book explores a popular national park and is packed with adventure as well as interesting facts about nature, outdoor safety, and much more.